In the future, drones will fill the skies. The world is abuzz (ha!) with news of innovative uses of unmanned aerial vehicles. Soon, our flying robotic overlords will be used for rescue operations, surveillance, counter-insurgency missions, terrorism, agriculture, and delivering frozen dog treats directly from the local Amazon aerodrome to your backyard. The future is nuts. For this week’s Hack Chat, we’re going to be talking all about unmanned aerial vehicles. 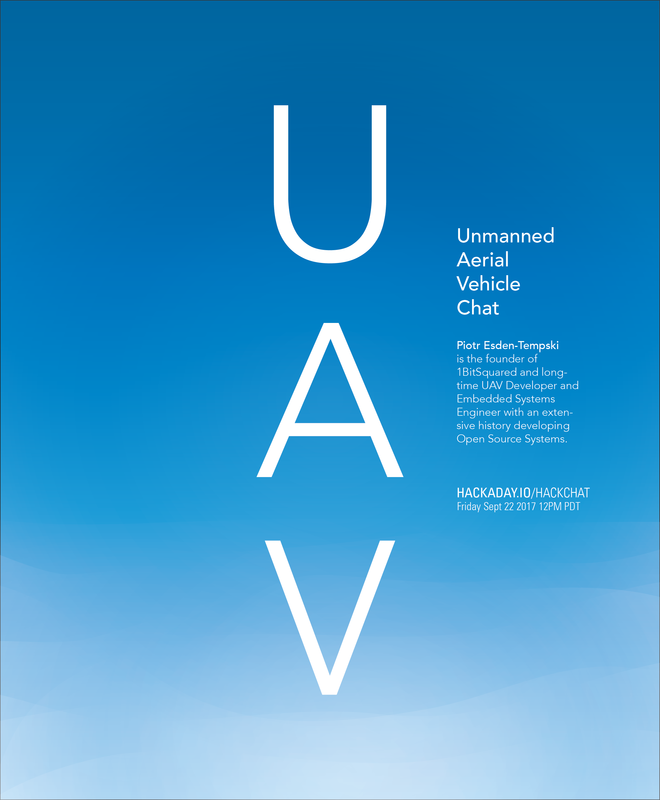 This is a huge subject, ranging from aeronautical design, the legal implications of autonomous flying machines, the true efficiency of delivering packages via drones, and the moral ambiguity of covering a city with thousands of mobile, robotic observation posts. In short, the future will be brought to us thanks to powerful brushless motors and lithium batteries. Our guest for this week’s Hack Chat will be [Piotr Esden-Tempski], developer of UAV autopilot hardware for Paparazzi UAV. Paparazzi can be used for autonomous flight and control of multiple aircraft, and we’ll be talking about the types of embedded systems that can be used for these applications. [Pitor] is also the developer of the 1Bitsy ARM dev platform, the Black Magic Probe JTAG/SWD programmer/debugger and the founder of 1BitSquared. In this Hack Chat, we’ll be discussing Open Source hardware design for UAVs, all things airborne robotics, the sensors that go into these flying robots, the stalled development (ay, another pun) of consumer and prosumer fixed-wing UAVs, ARM embedded systems, and JTAG and SWD programming and debugging. We’re also taking questions from the audience, and here’s the spreadsheet that will guide the discussion. Our Hack Chats are live community events on the Hackaday.io Hack Chat group messaging. This Hack Chat will be going down noon, Pacific time on Friday, September 22nd. Sidereal and solar getting you down? Wondering when noon is this month? Not a problem: here’s a handy countdown timer! I’ve become anti drone after the world governments have decided that the air we breathe is their property, so I sincerely hope that Hackaday in the future will be full of how to hack commercial and government drones with simple hardware. ardupilot should give you a good start. Ardupilot is a piece of art. It goes way back since before drones were invented.